Republic of Ireland Legends and Liverpool Legends pose for a photo before the game. 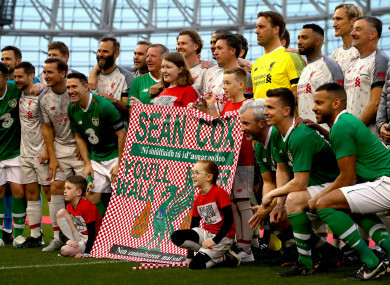 LIVERPOOL LEGENDS BEAT their Ireland counterparts 2-1 on an emotional night at the Aviva Stadium, in which 26,873 fans turned out in aid of the Seán Cox Rehabilitation Trust. Just under 12 months on from a vicious attack, which took place before a Liverpool-Roma Champions League semi-final at Anfield and left Cox with life-altering brain injuries that require constant medical care, numerous legendary players lined out to show their support for the Irish football fan. Robbie Keane, Steve McManaman, John Aldridge, Robbie Fowler, Ronnie Whelan, Ray Houghton, Sami Hyypia and Niall Quinn were among the stellar names to feature on a special evening at the Aviva, with Kenny Dalglish and Mick McCarthy the respective managers for the night. Almost €2 million has already been raised in support of Cox and his family and tonight’s benefit will add to that sum. Along with his wife and three kids, Cox was present for the big occasion. The Dublin-born and Dunboyne-based man, who spoke publicly for the first time since the attack on Thursday and has made steady progress in the months following his injury, ventured outside a medical setting for the first time in almost a year to attend the game. And fittingly, it was Cox himself who inspired the biggest cheer of the evening, when he appeared on the big screen midway through the first half, watching on in the crowd. Prior to kick off, news came through that Liverpool legend Tommy Smith had passed away at the age of 74, adding a further sense of poignancy to the evening and prompting a respectful pre-match moment’s applause from the crowd. The game itself was an entertaining affair, with Keith Andrews giving the Irish team the lead their early dominance deserved on 26 minutes. The former Blackburn and Wolves player, who is currently part of Ireland U21 boss Stephen Kenny’s coaching staff, left Liverpool goalkeeper Sander Westerveld with no chance, as the unmarked midfielder glanced home a well-executed cross by ex-Cardiff and Sunderland man Graham Kavanagh. Liverpool were back on level terms 11 minutes later. A rash tackle from Kenny Cunningham inside the area sent Jermaine Pennant to the ground. Ireland and Liverpool legend John Aldridge stepped up from the stop and made no mistake, sending goalkeeper Wayne Henderson the wrong way and placing the ball neatly into the corner of the net. With both teams much-changed in the second half, it was Liverpool who increasingly gained the upperhand. Keane, who had switched sides at the break, played a perfectly judged through ball to ex-Czech Republic international Vladimir Smicer, who rolled back the years by bursting ahead of Liam Lawrence and finishing coolly past substitute goalkeeper Shane Supple for what turned out to be the winning goal. Of course, nothing will make up for what happened to Cox that fateful night outside Anfield, but on a week when Irish football was under the microscope for the wrong reasons, this evening emphasised the power of the game to bring people from a variety of different backgrounds together in aid of a very important cause. Martina, for whom it has been an incredibly difficult year, paid fitting tribute to her husband and all those who have supported him, in tonight’s programme notes. Part of her statement read: “On behalf of Jack, Shauna, Emma and the extended Cox family, I would like to express out sincere thanks to all who have made this huge event happen; in particular Liverpool FC, the FAI and the Legends Organising Committee who worked tirelessly to bring this whole day together. Ireland: Wayne Henderson, Kevin Foley, Steven Reid, Kenny Cunningham, Ian Harte (Houghton 36), Ronnie Whelan (Kavanagh 17), Keith Andrews (Lawrence 32), Lee Carsley (Fahey 32), Stephen Hunt (Kilbane 32), Kevin Doyle, Robbie Keane. Subs: Sean St Ledger, Graham Kavanagh, Andy Reid, Stephen Kelly, Liam Lawrence, Colin Healy, Alan Quinn, Kevin Kilbane, Keith Fahey, Stephen Elliot, Ray Houghton, Phil Babb, Jason McAteer, John Aldridge. Liverpool: Sander Westerveld, Bjorn Tore Kvarme, Jason McAteer, Sami Hyypia, Phil Babb, Steve McManaman, Robbie Fowler, Jermaine Pennant (Partridge 43), Vladimir Smicer (Aldridge 35), Patrik Berger, Michael Thomas. Subs: Glen Johnson, Ronnie Whelan, Robbie Keane, John Aldridge, Ian Rush, Richie Patridge, Neil Mellor, Kevin Gillespie. Ireland: Henderson (Supple 59), Cunningham, St Ledger, Quinn (Babb 77), Lawrence (McAteer 71), Healy, Kilbane (Quinn 77), Fahey, Elliot, Houghton (Andrews 63), Aldridge (Doyle 59). Liverpool: Westerveld, Kvarme, Hyypia, Babb (Smicer 65), McAteer (Mellor 65), McManaman (Pennant 59), Whelan (Thomas 59), Partridge, Berger, Keane (Fowler 89), Fowler (Gillespie 71). Donations can made to Seán and his family on the Go Fund Me page Support Seán Cox. Email “Liverpool legends beat Ireland as Seán Cox and over 26,000 fans watch on”. Feedback on “Liverpool legends beat Ireland as Seán Cox and over 26,000 fans watch on”.